Who doesn't love a hearty dinner? This is one of my favorite "go-to" easy, beefy dinner recipes when I don't know what else to cook. 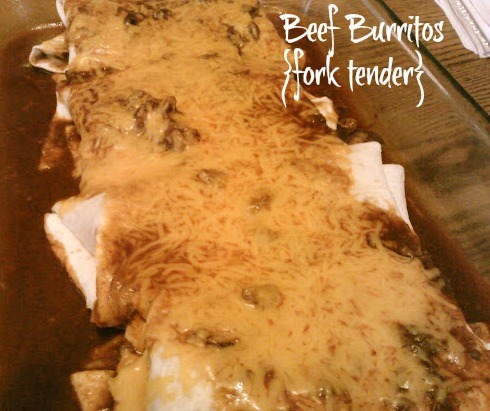 The beef gets fork-tender, is full of great flavor, and tastes so good in a tortilla shell covered in enchilada sauce and cheese! It is SUPER SIMPLE! Just put the beef in the slow cooker, let it cook and become tender, divide it among some shells, add some sauce and cheese, pop it under the broiler and you eating in no time! I found this recipe over at Food-Pusher over the summer and it has been a staple in our house ever since! Place beef in a slow cooker. Add the enchilada sauce and bouillon cubes to the beef. Set on low; let cook for 8 hours. Heat the refried beans in the microwave or on the stove and spread a layer in each tortilla shell. 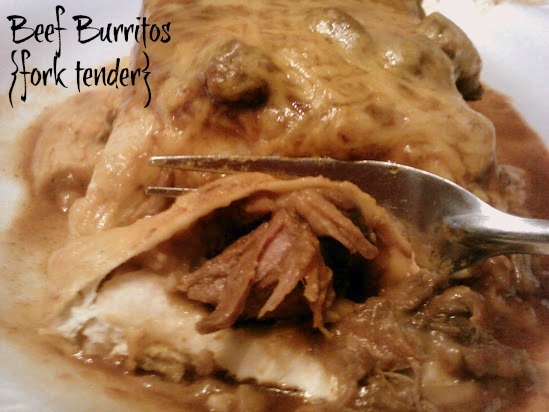 Add beef to the shell lined with the refried beans, roll shell into a burrito, and place seam-side down in a lightly greased baking pan. Repeat until you have the desired amount of burritos in your dish. Scoop some of the sauce from the slow cooker out with a spoon and pour over the burritos. Sprinkle the burritos with shredded cheese. Place under the broiler in your oven for no more than 5 minutes; until cheese is melted and bubbly.